Last week my productivity level had increased and I was able to finish more tasks than the previous weeks. I became more familiar with the concepts and things that I am working on, my ability to find answers and solutions for my questions and problems became better, it’s all about how you ask your question. Last week I finally solved one of the problems I faced for the past two weeks which is how to display multiple view types in multiple view holders within the same RecyclerView adapter which made working with other tasks much easier. Also, I used Anko library to create views in the code much faster than the conventional way, you can check their GitHub page for more information. Also, I start working with another library to deal with images, it helps you to take pictures and crop them as you want. The library does very much anything for you, all you have to do in your code is to tell the library you want to take a picture then it will open the camera or gallery or any other application of your choice then start a new activity for cropping your picture, then return your cropped picture to your activity. You don’t even need to create a new activity for cropping the picture the library will created for you, you just need to add the activity to your manifest file. For more information about this library, you can check their GitHub page. I may do a tutorial on how to use this library in the future. Islam told me that one of the reasons that I am writing these posts because it is a way of knowledge sharing and giving back to the open source / free knowledge community. I am a big supporter of free knowledge, I personally benefit a lot from videos, tutorials, and articles that people share online for free just for the sake of sharing knowledge. So this post will be a tutorial on how to use multiple view holder within a single adapter. I am not saying this is the best way to do it, I will just show you how I solved it and what worked for me. I talked about the RecyclerView in a previous post. You can check it out before continuing in this tutorial. This tutorial was inspired by this tutorial. Also, I am a fan of the anime “Attack on Titans”, so I will use some of the anime characters in the tutorial. The source of photos and information from this website. 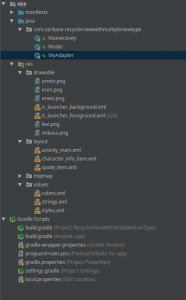 All codes for this tutorial were written using Kotlin, I am using Android Studio 3.0.1. I will assume that you know how to start a new project and I will also assume that you checked the auto-import option in the setting. Add this line to gradle then sync the project. Now you are ready to use the RecyclerView. In this tutorial, we will implement two view types(quote, character info) that will be inflated by two different layouts, each one of them has its own implementation (view holder) in the recycler view adapter. In activity_main.xml I am using Linear Layout as the root view and then I added the recycler view as its child. Now we need to create the layout for the two view types., I used view just to add a horizontal line as a separator. quote.xml for the Quote view type which consits of just text views. character_info.xml for the Character view type which consits of text views and an image view. It has couple of texts and an image to displayed later each one in its related view holder. For the MainActivity.kt two functions are added. The first function is for creating an array list and fill it with required data to be send later to the recycler view adapter. The second function is for just setup the layout manager for the recycler view and set its adapter. In the onCreate function in the MainActivity.kt these two function are called. In MyAdapter.kt class which is our adapter, we will create two sepertae ViewHolder classes for each of the two layouts I menthioned earler as shown bellow. Here we are, we finished coding. Now, are you excited to see what the output of your work?! Here is the output for the application we built. I hope you enjoyed and benefit from this tutorial. If you have any feedback or questions please leave a comment.